Sports and physical activity are a wonderful part of many children’s development. They can provide valuable lessons on perseverance, teamwork, and grace, all while keeping the body in fit shape. With sports, however, comes the possibility of sports injuries. Sometimes it’s by accident; other times it’s by pushing too hard. Whatever the cause, it’s important to ensure sports injuries in children’s feet and ankles don’t run the risk of becoming a long-term problem. Sports injuries in children tend to happen much the same way they do in adults. The difference is that, because children are still growing and developing, they face a greater risk of being injured than adults. The act of growing itself also has the potential to cause problems in itself. Stress Fractures – As opposed to fractures that break fully through a bone (which are also relatively common), stress fractures appear as cracks along the surface of a bone. These types of fractures are formed over time due to repetitive impacts on the foot, such as running or activity drills. If too much pressure is placed on the bones over time, and regularly enough that the bone does not have proper time to recover, the bone begins to degrade and form cracks. Children with stress fractures may feel a mild pain and tenderness that grows worse over time. Resting will decrease the pain. Sometimes swelling is also present. Sever’s Disease – If an active child is experiencing pain in his or her heel, then Sever’s disease is always a consideration. This condition, also known as apophysitis, is an inflammation of the growth plate in the heel bone. Repetitive stress on this vulnerable area during a child’s development can result in swelling and pain. Ankle Sprains – Common in many circumstances, an ankle sprain is an injury to a ligament connecting bones in the joint. The ligament keeps the joint from moving too far, but can be overextended and even torn. Symptoms of an ankle sprain include pain, swelling, bruising, stiffness, and trouble bearing weight on the ankle. Other types of injuries involve muscle strains, tendon injuries, and neuromas. 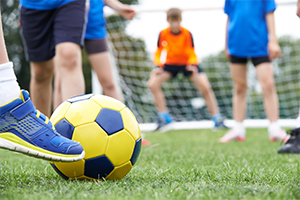 Treatment for children’s sports injuries is going to vary depending on the type of injury, its severity, and other factors such as the age of the child. One thing consistent through every injury, however, is that rest will be required in some respect for full and safe healing. It is very important to properly identify the injury and follow the right treatment plan. Choosing to engage in activity too soon may, in some cases, cause an injury to not fully heal. In the cases of injuries such as ankle sprains, it may lead to chronic pain and weakness. Treatment for most injuries tends to involve a reduction in weight-bearing on the injured area. Certain activities will likely be off limits for a while, but in some cases can be replaced with low-impact activities such as swimming or cycling. In more severe injuries, surgery might become a consideration if conservative treatments are ineffective. While it is impossible to prevent all injuries, many injuries as a result of repetition and overuse can be avoided. Ensure your child is wearing the proper footwear for his or her sport, and that it is providing enough cushioning. Remind your child to never try to push through pain and stop activity immediately if they suddenly experience it. Your chlid’s coaches should also be trained in recognizing injuries and considerate in avoiding overuse. If your child is suffering from consistent pain in their foot, ankle, or heel, it’s not something to walk off. The doctors at Martin Foot and Ankle can identify the problem and discuss with you the best course to get back to action safely. Whether it involves simple rest, orthotics, surgery, or physical therapy, we can guide you through every step. Our offices in Hanover, Lancaster, Lititz, and York are here for all your family’s foot and ankle needs. Just give us a call at (717) 757-3537 or use our online form to reach us. ?How long should my child rest before returning to activities? ?Should I apply heat or ice to a child’s foot injury? ?What are common causes of children’s heel pain?